Specimen very kindly donated by Dr. M. Luff Unlikely ever to be found in our Watford area; most records are from Durham, Northumberland and Cumbria, there are a few records from Lancashire and central Scotland and a single (older) coastal record from Moray (Luff, 1998). This species is interesting as the only British Pterostichus with simple elytral margins ie the inner edge of the epipleurs do not cross the elytral margins before the apex. Of very local occurence although they may be abundant where found, usually in moist situations in woodland and gardens but also in shaded grassland. Adults are spring breeders occuring from June to September. 14-17mm. 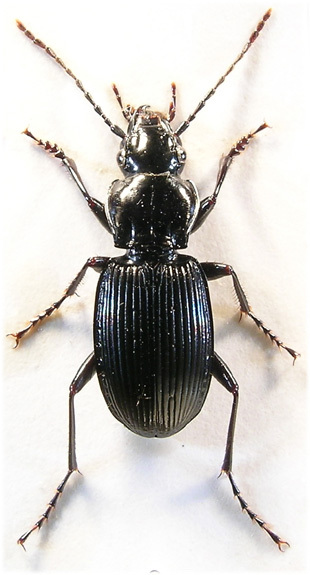 (Lindroth, 1974) Entirely shiny black with apices od appendages rufous. Head smooth and shiny with well developed frontal furrows, two setiferous punctures beside eyes which are convex and protruding although proportionally rather small. Mandibles long and protruding, sharp and without setae on outer surface. Antennae long and slender, basal segments without a keel on dorsal surface and first segment about as long as third. Pronotum slightly transverse, sides rounded and sinuate before sharp, almost perpendicular, hind angles. With two basal fovea; inner deep and long, outer obscure and lacking a ridge on outer side. Elytra narrowly oval with apex rounded, dark, as pronotum, but distinctly irridescent. Striae, including scutellary, deep and well developed, not or scarcely punctate. Interstices convex, third with 3 or 4 setiferous punctures (Lindroth, 1974). Epipleurs uncrossed. Wingless. Legs long and relatively slender. Protibiae strongly notched inside before apex and with a single apical spur by inside edge. Last segment of all tarsi with rows of setae beneath. Claws smooth. Basal segments of protarsi dilated in male.